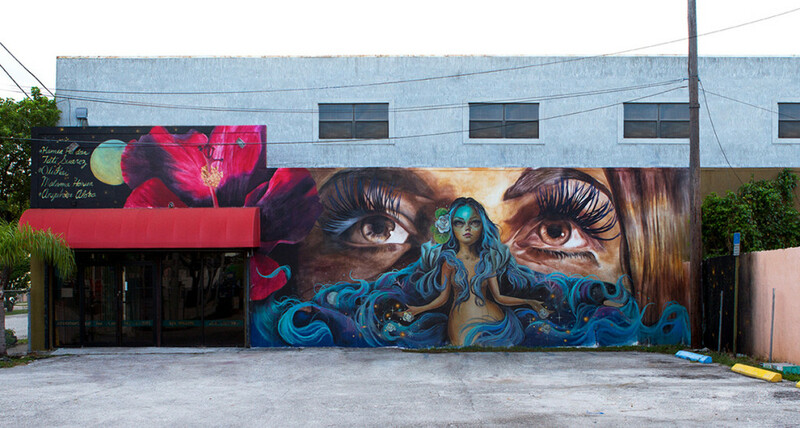 “Hina” mural of Hawaiian moon goddess painted by Kamea Hadar and Tatiana Suarez in 2014 on the building in Little Haiti that now houses Laundromat Art Space. “How do you deal with history in a city that is always in the process of becoming?” designer Domingo Castillo ponders at the Little River gallery he, Loriel Beltran and Aramis Gutierrez branded Guccivuitton (8375 NE 2nd Ave.) as elite retailers displaced several artist-run spaces in the Design District. “Art is a luxury object. Just having the time and money to do this is a luxury.” Low rent helps maintain autonomy despite few sales and loans from collectors to “look at contemporary artmaking through a historical lens,” as in “The Christmas Show” until January. Guccivuitton’s new neighbors Eddie Negron and Marla Rosen named Jenielift (8365 NE 2nd Ave.) after the Genie equipment that elevates their day labor as art handlers. 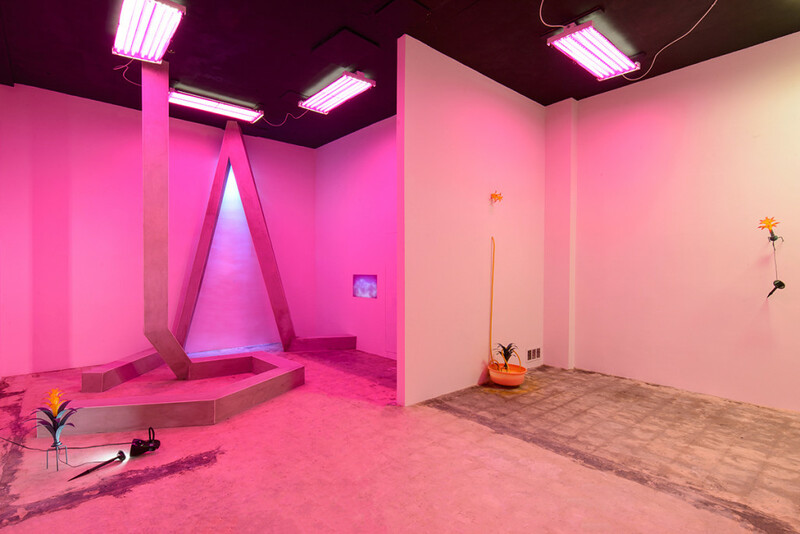 The duo engages critical dialogue through scholarly presentations and catalogs for installations like the U.S. premiere Dec. 3 of Argentinian Sergio Vega’s project shown at biennials and museums. Due south in Little Haiti, nine artists moved into studios this spring at the cooperative Laundromat Art Space (5900 NE 2nd Ave.), where a common area and gallery host exhibitions as well as diverse activities with community partners. Founder David McCauley is offering art therapy workshops and approaching curators and artists to reimagine the insides and façade of the building, already graced with a moon goddess by Hawaiian muralist Kamea Hadar and Miami’s Tatiana Suarez. Seeing potential in the empty passage below his Little Havana studio five years ago, Adal Delgado conceived 6th Street Container (1155 SW 6th St.) as an outlet for his aging contemporaries. Now he also welcomes regional art students and graduates like Yasmin Khalaf, who debuts deconstructed paintings Jan. 15. 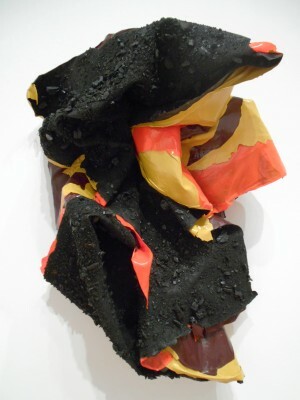 Yasmin Khalaf, “Aurora”, 2015, crushed hardwood charcoal, acrylic paint, canvas, 35 x 28 x 8 in. at 6th Street Container in Little Havana. The cause of celebrating established but overshadowed stalwarts was taken up at the North Miami complex where father-daughter landlords Robert and Kristen Thiele devote Bridge Red Studios Project Space (12425 NE 13th Ave.) to “developed bodies of work by under-exposed artists working diligently.” This long-range view frames highlights Jan. 24-March 6 from the collection of Helen Kohen, The Miami Herald’s beloved art critic emeritus who departed this year. Lou Anne Colodny also dedicates most of her workspace downstairs to mid-career artists; Under the Bridge spotlights Carlos Sandoval De León Nov. 22-Jan. 3. A reverence for “makers and their objects” unites the interdisciplinary collective behind Meetinghouse (168 SE 1st St.), inaugurated last November at a 1920s penthouse downtown. Process and product mingle in group shows, with painter Babette Herschberger, architect Allan Shulman and art director Philip Bonnery joining video artists Carlos Rigau and Marin Kasimir Dec. 1-Jan. 9. Six artists take turns at the wheel of the Co-worker, an old RV that Brandon Opalka converted into an itinerant timeshare. Each member gets two months to customize the contents and destinations, steering this new artist-run model into undiscovered realms. Among those hunting for new homes are Bas Fisher Invitational (www.basfisherinvitational.com), Dimensions Variable (www.dimensionsvariable.net) and Turn-Based Press (www.turnbasedpress.com) as Miami Worldcenter prepares to replace Downtown ArtHouse and its surrounding blocks with a 28-acre retail and residential complex. The final show onsite in December is BFI’s “Artist Swap” with Danish ensemble Toves, whose collaboration dwells on navigating impermanent physical and virtual terrain – an apt prelude to the pop-up exhibitions and performances director Naomi Fisher is staging while relocating BFI, launched with Hernan Bas (now in Detroit) 11 years ago. The patrons who donated their Design District studios encouraged expanding access, recalls Oliver Sanchez. A collegial spirit still permeates Swampspace (3940 N Miami Ave.), where Sanchez orchestrates some 20 cohorts’ riffs on the implications of automation in “The Machine Show” opening Dec. 1. Glauko Alizara and Luca Wayra, “Dynamism Redux”, installation view of the inaugural show this summer at Jenielift in Little River.